Healthcare is on everyone’s mind these days. But while the government fights over what the federal guidelines will be for healthcare in our country, loved ones still need quality care. As day-to-day life goes on, so does caring for those with chronic illnesses and other healthcare concerns. Celtic Healthcare remains steady in their focus on excellence in patient care. As the spotlight on the quality of healthcare is ever-increasing, Celtic has already set their own high standards to ensure that patients receive the highest quality of care to guarantee the best possible clinical outcomes and the best possible patient experiences. “For us, the nation’s focus on quality healthcare is an exciting proposition. It means that everyone is held to higher standards. That means better healthcare for everyone,” said Bill Gammie, Vice President of Regional Operations for Celtic. As the boomer population ages, Gammie sees the need for quality health care remaining a vital, if not even increasing, focus in our society. It is a generation who has paid attention to their health like no generation ever before. “Now that the boomer generation is moving into their senior years and needing more healthcares, this issue is going to remain in the forefront,” he said. For Celtic, that means continuing to work closely with other healthcare partners to provide that care through home health, palliative and hospice care. “Our support to hospitals and physicians is in better focus than ever before,” Gammie said. The services provided by Celtic are critical in the patient experience and satisfaction, said Gammie, with important attention to programs that avoid readmission. Celtic Healthcare is building collaborative programs and models of care to share data with other healthcare providers and each other so chronic conditions can be best treated. “We can help significantly reduce avoidable readmissions,” he said. Celtic already has in place various protocols to ensure these avoidable readmissions. The Virtual Care™ program provides quality, on-going healthcare monitoring with reduction in costs, and improvements in patient satisfaction. “Our Virtual Care methodology has demonstrated an 80% reduction in unnecessary hospital re-admissions among chronic patients,” Gammie said. Through the Virtual Care program, Celtic health care providers monitor and educate patients on self-care with guidance and assistance. Healthcare records are better monitored. The Virtual Care Coach and Care Coach Nurse work together and with the patient’s physician to oversee daily patient care and intervene when necessary. All patient information is easily accessible to all healthcare providers involved. While working closely with doctors and other hospital case management professionals, Celtic creates a healthcare team to provide the best possible healthcare for their patients. “We believe the team is more important than ever. You can’t do it alone, and when all aspects of the health care team works together to ensure good care, enhanced health and wellness results, and even survivability increases,” Gammie said. Obviously, reduction in readmissions is beneficial to the patient, but it is also an important and valuable reduction in overall healthcare expenses. In light of changing reimbursement and care delivery models that are arising from healthcare reform, it is more critical than ever to our healthcare system and community. “Celtic is excited and challenged by the future of health care. We know that we must work with various healthcare providers for the benefit of the patient to provide the highest quality and most sustainable health care for all. That is why our team care approach is so successful,” Gammie said. 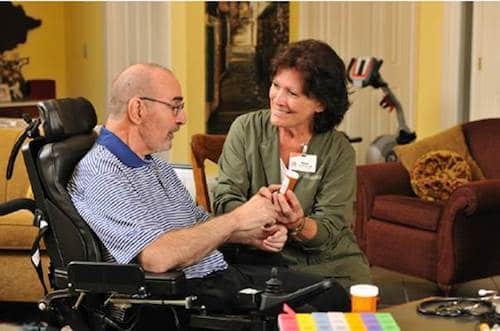 For more information about Celtic Healthcare visit www.celtichealthcare.com or 800-355-8894.